successfully concluded recently with the ‘Science Popularization Lecture’ and valedictory function held at INOX, Panjim. 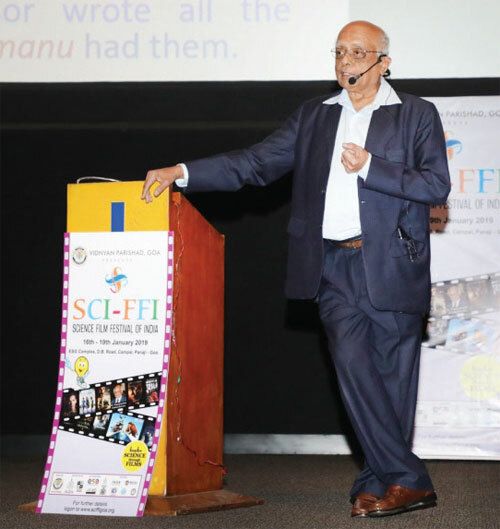 Dr Rajagopala Chidambaram, Padma Vibushan, had his address as the climax of SCI-FFI 2019. He was the Chief Guest for the Valedictory function who delivered a lecture on ‘India’s Nuclear Programme- A model for developing world’. He conveyed facts on the topic and also conducted a Q & A session with the audience to further edify them. He cited his appreciationstating that utmost work has been put in by the organizers to make sure scientific awareness is spread well across the youth. Other dignitaries included Jayantrao Sahasrabuddhe, National Organizing Secretary of Vijana Bharati, Dr. Sunil Kumar Singh, Director NIO and Chairman of Organizing committee, Prof. Suhas Godse, President of Vidnyan Parishad, Goa, and Abhay Bhamaikar, Secretary of SCI-FFI 2019. The four-day festival included screenings of blockbuster films like Parmanu, Ice Age 4, Hidden figures, First Man and many more. This was followed by expert interactions with prominent scientists like Dr. Shekhar Mande, Director General, Council of Scientific and Industrial Research, Govt. of India, Prof. Sharmistha Banerjee, Senior faculty from University of Hyderabad, Dr. Arvind Ranade, Scientist F, Vigyan Prasar, New Delhi, Dr. Sumeet K Mishra, Senior Scientist, Environmental Sciences & Biomedical Metrology Division, National Physical Laboratory and Dr.Tarkeshwar Singh, Professor, Department of Mathematics, BITS – Pilani, Goa campus were also a part of the main event, that discussed scientific concepts associated with films. This led to a better comprehension of science through entertainment. Apart from this, three theme-based film tracks; ‘Future of the Oceans’ ‘Technology and Innovation’ and Basic Sciences’ became a part of this year’s festival, that presented scientific research and awareness conveniently and entertainingly to a wide-ranging audience and demonstrated that science can be enjoyable. Telescope-making and Teachers’ workshop were exuberantly conducted to enlighten the educators and those seeking education in the field. The all-inclusive experience provided through this year’s program and activities received an overwhelming response from not just the science enthusiasts but also professionals in the subjects. Exhibitions by well-known national institutes namely National Institute of Oceanography (CSIR-NIO), National Centre for Polar and Ocean Research (NCPOR), Indian Council of Agricultural Research (ICAR), Goa State Innovation Council (GSIC), Vikram Sarabhai Space Exhibition (SAC, ISRO), Nuclear Power Station, Kaiga and ‘Indian Scientist-Gallery’ were also held. The vote of thanks for the valedictory function was proposed by Manohar Pednekar, Secretary of Vidnyan Parishad,Goa. His address marked the end of the event but not the love for science. This year the pre-fest covered 125 institutions across Goa and 3 in the state of Maharashtra. The main event saw 25,000 students across 210 institutions in 5 states benefiting from SCI-FFI 2019. The success stood inevitable with the opportunities it provided for tender minds and it will continue to grow and get bigger with Vigyan Prasar collaborating with Vidnyan Parishad for the next edition in 2020.